June is Brain Injury Awareness month and it is a great thing to take time and educate people, (both yourself and others) to bring everyone together to share stories, and to shed light on a little known subject that is very touching to many lives. It is also great to be able to mark something on the calendar and then go ahead with preparations for a fun (yet very serious) and informative event. But even though I appreciate Brain Injury Awareness Month for what it delivers in those thirty days, that Awareness should continue all year around. People need to know and understand what brain injury and its effects can have on lives. Brain injury alters lives, it challenges them and it can and usually does bring about multiple hardships; to those who have suffered the injury and (in different but also similar fashion) those family and friends that are part of that life. But the injury, no matter what some people experiencing it first hand, or even viewing it from a distance, may think or feel, doesn’t have to destroy lives. Patience, inner strength and maybe some empathy are required, but there is no need to fear brain injury and/or give up on the beauty of life. That is the Awareness I appreciate bringing about and hearing exchanged; giving people knowledge and hope and forward, positive, thinking. I appreciate sharing it with those who don’t quite get it because of the fact that they see it from the outside; and to those who have that lived experienced and may need a little guidance. I also like the idea of using Awareness to help eliminate stigmas, myths and misconceptions that surround brain injury. But I mostly appreciate what awareness has brought to my life. It has helped shed light onto a darkness that made me feel lost and in many ways alone. Brain injury is not fun, and like any other disability, I would not wish it onto anyone. I have faced many struggles and fought many battles and even though acquired many years ago at a young age, I still encounter various barriers. Awareness has helped me to grow and learn. Life is what it is. I cannot press ‘rewind’ and go back, I can only move forward. Acquiring a brain injury is a sad thing, but it does not make that person’s life wrong. That is what this Awareness thing is all about, to teach all of us that while an understanding is needed and hardships will be endured, life goes on and it can blossom. Please join the Brain Injury Society of Toronto in its Awareness campaign. 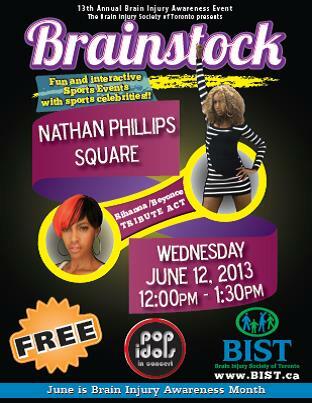 Attend the BIST Brain Injury Awareness event, Brainstock, June 12th 2013. But also carry that Awareness with you. Remember for yourself, share it with others, and then we can all grow and appreciate together. We Google so much, from “that cello song” to “how to tie a sailor’s knot”. Well written, Mark, awareness is needed in order to further explain things people don’t even think of Google-ing, so to say.